Over the last few years I’ve gotten in the habit of sending my grandparents cookie care packages about once a quarter. I don’t live very close to my grandparents in Long Island or my grandmother in Georgia, so sending them cookies is my way of telling them that I’m thinking about them and reminding them that I’m a fantastic baker. The purpose of the seasonal cookies is obviously to make the package festive. In December it’s a Christmas cookie; in the spring it’s heart shaped shortbread, Hamentashen, or coconut macaroons; in the fall it’s something pumpkin oriented; and the summer is kind of a wild card. The heartier choice is sort of the same idea as putting vegetables in your kid’s mac and cheese. Cookies with oats, dried cranberries, nuts, or bananas add a couple little nutritional elements to my grandparent’s limited daily diet. I know that my cookies are better for them than any of the baked goods they buy at the grocery store. Lastly, I throw in one or two mini loaves of a quick bread. I usually do banana bread because it’s just so easy, but I’ll also do cranberry nut bread or zucchini bread. I just know my grandparents all love quick bread so I try to always include it. This past weekend I baked for a care package for my Grandfather in Long Island. He’s turning 94 next week! 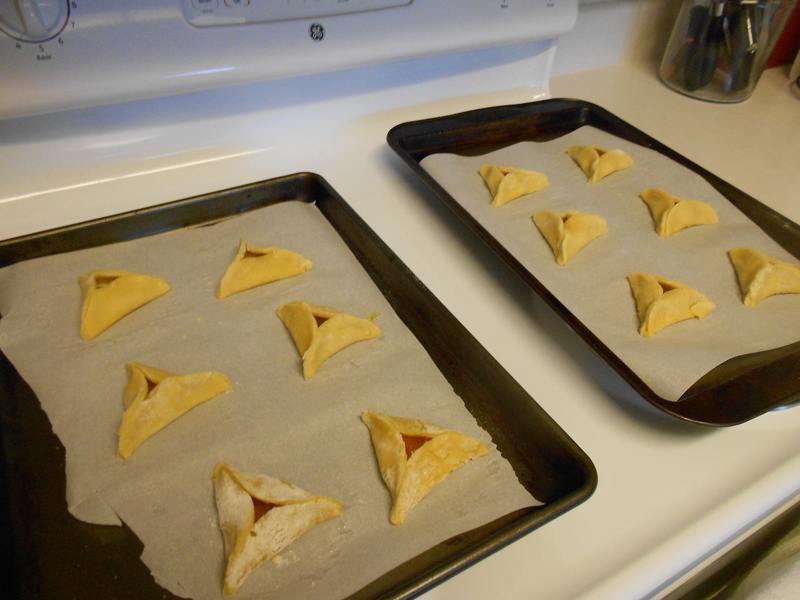 Keeping that in mind, I made two of his favorites- Hamentashen (it’s Purim season) and banana bread. I also added chunky lola cookies (adding Craisons to the recipe) for a little extra something. On the one hand, Valentine’s Day is all about the date night, but on the other hand it’s all about classroom card exchange and an excuse to baking everything in the shape of red and pink hearts. As we know I love an excuse to bake with a theme or season in mind, so I have done a lot of the latter over the years. If you’re thinking about baking this week, I have three ideas at three different difficulty levels. This options wins when you think about effort vs. reward. You just take the standard recipe, add a little red food coloring, and presto- Valentine’s Day Rice Krispie Treats! Themed mix ins- sprinkles, white chocolate chips, etc. Melt the butter in a sauce pan or small stock pot over the stove on low/medium heat. Add 1 bag of marshmallows to melted butter and allow to melt together. Add vanilla extract to melted mixture. Add drops of food coloring until you get the color you want (less is more for food coloring, take it easy). Have the six cups of Rice Krispies and half bag of marshmallows ready in a large bowl. Add warm butter and marshmallow mixture to the cereal and leftover marshmallows. Stir until uniform. At this time you can add in sprinkles or any other mix-ins you would like. I add the sprinkles later on so they don’t melt completely. Transfer to a 9 x 13 baking pan and allow to cool. Then use cookie cutters to create heart shapes! Shortbread sounds a little boring, but you bring these to work and your co-workers have one with their morning coffee and you will be their best friend forever. You can dip half the heart in chocolate and add pink or red sprinkles to make them fancy. I use Ina Garten’s classic shortbread recipe for this. It says is makes 20 cookies, but my guess is that you get more than that. Cream butter and sugar together until the mixture is light and fluffy (about 5 minutes). Add vanilla extract to mixture. In a separate bowl sift together the flour and salt. Then slowly combine the wet and dry mixtures, trying not to over mix. Chill the dough for at least 30 minutes to overnight. 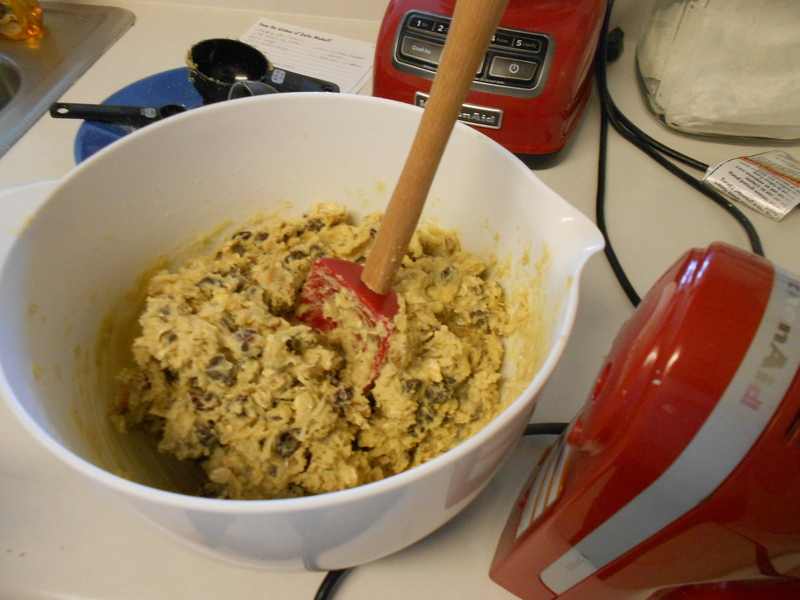 Roll the dough out to quarter to a half inch thick depending on how thick you would like the cookies. Use your heart shaped cookie cutter to cut out the cookies and place on a parchment lined cookie sheet. Bake cookies at 350 for 20-25 minutes until just slightly golden brown. They shouldn’t get too much color. Melt the chocolate in 30 second increments in the microwave. Once it’s shiny you can just stir it until it’s all melted together. Use a spoon to paint half of the baked and cooled cookies with chocolate. If you would like you can dip the chocolate part in sprinkles or chopped nuts to add a little je ne sais quoi. Allow chocolate to cool and solidify before storing. Here’s where the degree of difficulty gets ramped up a little. This is for when you’re baking to impress. If I were you, I would not start making these on a whim because they take some time, effort, and a serious clean up. The plus side is you get major bragging rights, because you just made marshmallows from scratch! Prepare a 9 x 13 brownie pan with parchment and dust the bottom with powdered sugar. In a mixing bowl combine the gelatin with a ½ cup of water. Allow the gelatin to “bloom” (I think it’s called) while you cook the other mixture. Some recipes recommend a full half hour. In a saucepan over medium heat, combine the corn syrup, sugar, and a half cup of water. After the sugar melts, turn the heat up to high, and cook until it reaches 240 degrees (use a candy thermometer). Once the mixture has reached the correct temperature, remove from heat. Use an electric hand or stand mixer to mix the gelatin on low as you pour in the warm mixture in very slowly. Once the mixture has been completely poured in, mix it on high for about 15 minutes until the “fluff” is pretty thick. Add vanilla, salt, and food coloring and mix until well distributed. Pour the batter into the prepared pan and use a spatula smooth it out. This process will be a little sticky and difficult, but you will persevere. Dust the top of the fluff with powdered sugar (it is easy if you pass it through a sifter). Allow the fluff to “dry out” overnight. The next day, lift the large marshmallow out of the pan and place on a cutting board. Use a knife or a heart shaped cookie cutter to cut out the marshmallows. Microwave the semi-sweet chocolate chips for 30 seconds at a time until mostly melted. Use a fork to stir the chocolate until smooth. Dip the marshmallows in the chocolate, and allow to dry. Microwave the white chocolate similarly and place in a pastry bag with a fine tip or a Ziplock bag with a small corner snipped off. Once the semi-sweet chocolate has set, use the white chocolate to drizzle a design on top of the layer of chocolate. Allow to set at room temperature or place in the freezer to speed up the process. Enjoy! What are you making to celebrate? For whatever reason, I think the seasonal quick bread in the winter is cranberry nut bread. Maybe it’s because cranberries are a fall/winter fruit. I also like to think of cranberry nut bread as a little fancier than the standard banana bread, so I send it to family and friends with Christmas cookies. I’m actually not sure where I got this recipe, but I’ve had great success with it (if I do say so myself). The one hitch is that it includes orange juice and buttermilk which takes extra brain power when I’m at the grocery store (I forgot them, and I had to postpone the baking until after my next grocery trip). Preheat oven to 375. Prepare loaf pan(s) with non-stick spray. Combine orange juice, zest, buttermilk, butter, and egg. In a separate bowl, whisk together flour, sugar, salt, cinnamon, baking powder, baking soda. Combine wet and dry. Fold in cranberries and walnuts. For 9 x 5 loaf, bake for 20 minutes at 375 then reduce to 350 and bake for 45 minutes. Reduce time for smaller loaves. Use the toothpick test.